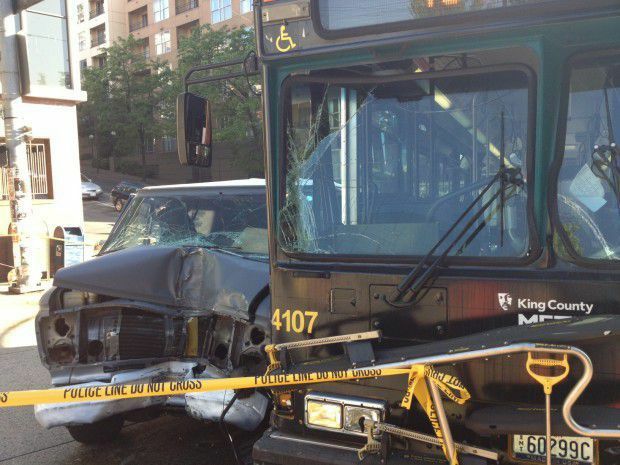 Two people sustained serious injuries from an accident involving a King County Metro bus Wednesday afternoon near Pike Street on Boren Avenue in downtown Seattle. Police say a man was driving an old Chevy van northbound on a downhill portion of Boren Avenue at approximately 4:45 p.m. Witnesses told police that the gray van ran a red light and crashed into a Metro bus that was traveling eastbound on Pike Street. Witnesses also told police that the Metro bus had the green light at the time of the crash. The male driver and female passenger were transported to Harborview Medical Center in Seattle to be treated for their injuries, and Seattle Fire Department spokesman Kyle Moore says the couple’s injuries were initially life-threatening. Joan Patrie, a witness who was biking home at the time and saw the accident occur up close, said the occupants of the van appeared to be critically injured in the crash. “They were in bad shape and not moving when I saw them,” she said. One woman on board the King County Metro bus was also injured as a result of the bus accident, and she was also transported to Harborview Medical Center to be treated for her minor injuries. Police sent a drug and alcohol recognition expert to interview the male driver of the van, who allegedly caused the bus accident by running a red light according to witness statements. There was no available information as to whether police believe the man was under the influence at the time of the crash. Wednesday’s Metro bus accident comes just two days after a Sound Transit bus was involved in a fatal crash in Kirkland, leaving two passengers dead and the driver of the vehicle critically injured. The bus driver in that accident claimed that the vehicle’s brakes failed just before the accident occurred, which caused him to lose control and prevent him from stopping the bus as it rolled through a red light and continued down the freeway for a couple of miles. The Washington State Patrol (WSP) has announced it will conduct a full inspection of the bus in order to determine whether there were any mechanical failures that may have contributed to the fatal accident. Although there has been no available information regarding the status of the WSP inspection, the fact that the man continued down the highway for a substantial distance suggests that the driver’s claims of brake failure may be legitimate. Regardless of whether the cause of the accident was driver error or mechanical failure, there are multiple injury victims involved who would benefit from consulting with a qualified personal injury attorney with experience in handling mass transit and bus accident cases. If the crash resulted in a fatality, it may be wise to open a wrongful death claim on their behalf.